PORTLAND, Ore. — One day after Oregon forward Jordan Bell disputed a report by Yahoo Sports that he would hire an agent and declare for the NBA draft, he made it official and declared for the draft. 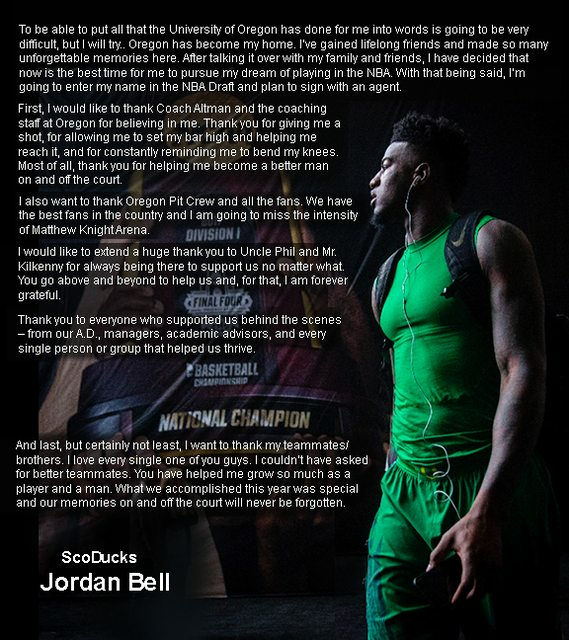 Bell announced the decision on longbeachtoday.com, expressing in a post his decision and his gratitude for the three seasons he spent at the University of Oregon. The news was first reported Sunday night by Shams Charania of The Vertical and Yahoo Sports. Bell denied the report on Twitter, calling it "fake news," denying he or anyone in his circle had spoken to Charania and saying he has yet to make a decision. I never spoke @ShamsCharania nor has anybody else in my circle so I guess it's a game of he said she said or as he called it "sources"
Adrian Wojnarowski, editor of The Vertical, confirmed the accuracy of the report Monday. Bell, a 6-foot-9, 225-pound forward, averaged 10.9 points, 8.8 rebounds, 2.3 blocks and 1.3 steals in 28.9 minutes per game his junior season. He helped lead the Ducks to a Final Four appearance against North Carolina. During the NCAA tournament, Bell averaged 12.6 points, 13.2 rebounds, 3.2 blocks and 1.6 steals per game while making 73 percent of his shots from the field. In Oregon's 77-76 loss to the Tar Heels in the semifinal, Bell had 13 points, 16 rebounds and four blocks. Bell is projected to be a late first-round or early second-round selection. DraftExpress has Bell going to the Chicago Bulls with the eighth selection in the second round (38th overall) in a mock draft; NBADraft.net projects him to the Utah Jazz with the last pick (30th overall) in the first round; and ESPN ranks Bell 39th in its Top 100. If Bell leaves for the NBA, he will become the fourth Ducks player to leave the program this offseason. Sophomore guard Tyler Dorsey and junior forward Dillon Brooks declared for the NBA draft and junior guard Casey Benson plans to transfer to a different school. Editor's note: An earlier version of this article reported the Ducks played North Carolina in the national championship game. Oregon played North Carolina in the Final Four.